ANH VIET TOURIST COMPANY sincerely sent respectful greetings and best wishes to travel agencies in domestic and foreign ! ANH VIET TOURIST Company with over 15 years working in various fields such as organizing European tours, visa, air ticket agents of international and domestic airline, leasing luxury apartments. 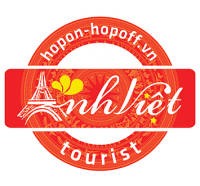 Hop On-Hop Off City Tours is a new tourism product of Anh Viet Tourist company- is considered one of the most attractive new tourism of Ho Chi Minh City in 2016. In addition to the advantages help travel itinerary of tourists is flexible, convenient, we are committed to always put reputation and quality of service to the forefront. With the motto ” ENJOY YOUR LIFE- ENJOY THE BEST STOPS” New tourism product – Hop on Hop off City Tours will give the tourists at the moment the most amazing tour. ANH VIET TOURIST with brand reputation and experience in the service and tourism field over many years, always build trust with customers by promoting the image of professional staff in the style of service, consultant. Make sure to bring quality services, best interests for our customers and partners. On behalf of all staff of the company, forward to the fruitful cooperation with the new attractive tourism product – Hop On-Hop Off City Tours. All the attention of partners honored for Hop On-Hop Off City Tours will promise a sustainable development for the new attractive tourism product. All contact please send an email to sale@anhviettourist.com. Sincere thanks and wish our partners and customers have a lot of health and success in the New Year in 2016!